The Grape & Grain was a well-stocked pub for ale lovers in Crystal Palace, overlooking the north-west corner of Crystal Palace Park. It closed down in November 2017. The property is owned by Wetherspoons, who had hoped to extend and redevelop the building, but had been unable to gain planning permission. As of September 2018 the premises remain vacant photo. A well-stocked pub for ale lovers in Crystal Palace, overlooking the north-west corner of Crystal Palace Park. Note: As of May 2014, beerguidelondon.co.uk reports that the Grape & Grain has been bought by Wetherspoons, though at the time of writing it doesn't yet appear on the Wetherspoons website. 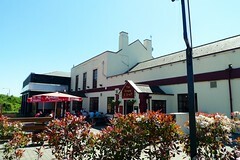 According to the August/September 2014 edition of London Drinker, the current management will continue to run the pub until their lease expires. It used to be the rather less salubrious Jack Beard's at The Palace (amongst other guises). Jack Beard's retained the lease for a while after the name change, but according to a comment on Beer In The Evening, the licensees (Rick and Angela) took on the lease in July 2010 after the Jack Beard's chain went into adminstration — there's more information, including input from Angela, on the Virtual Norwood forums. There are tables outside on a paved area overlooking a busy road junction (and the corner of the park), as well as plenty of space inside. On a very sunny Sunday afternoon in May 2010, there was still plenty of space to sit. There are now eight handpulls for ale, with a rotating selection of beers and ciders, including ones from the Dark Star and Westerham breweries (Freedom Ale on Ewan's May 2010 visit). There are also plentiful draught taps for such quality lagers as Meantime Kölner Bitburger, Licher Weizen, Sagres and Amstel, as well as Aspall's cider. The food menu cleaves to pub standards such as sandwiches, burgers, fish-based dishes (fish cakes, scampi and the like), and Sunday roasts. Ewan's scampi and chips were excellent quality, served with perfectly-cooked peas, and some flat, crunchy fries and a bit of fresh salad. Kerry's burger was somewhat disappointing, as the patty was thin and rather processed, but a fishcake salad was substantial and filling. According to the Grape and Grain website as of December 2011, there's a swing band every Monday, a quiz from 8pm every Thursday, jazz 2pm-8pm every Sunday, and an open mic night on the last Wednesday of the month. Ewan's verdict: This is a fine addition to the already good standard of pubs in the area, but importantly adding a destination venue for ale drinkers, though they have no shortage of other quality options. Last visited by bob, December 2011. Last edited 2018-09-09 10:36:11 (version 20; diff). List all versions. Page last edited 2018-09-09 10:36:11 (version 20).